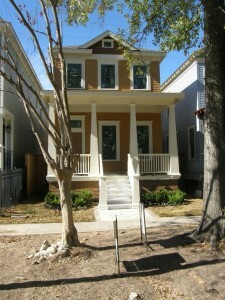 One of Two Heights New Homes at 1017 Waverly is Nearing Completion. Once approval is given (always waiting for approval), a temporary gas connection can be made so heat, fireplace, tankless water heater can be operated. I’m especially anxious for the heat; my Sunday open houses have all been rather dark, chilly days. My comfort is secondary though; the oak floors have to be thoroughly dried before they can be sanded and finished. So, the heat must be on for a week or so prior to finishing the floors. At that point, the house will be stunning. The floors are solid oak, so must be sanded before finishing. The painters know that, so they get spray mist all over the floors. This gives the house and photos kind of a white-out look. Once sanded, stained, finished, it will be an amazing transformation. The walnut inlay in dining room will sparkle.. So…keep watching for updates. 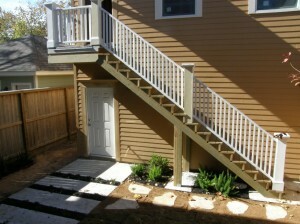 If you would like to preview this home or 1017B Waverly, Contact Rich Martin. Note: These homes have sold, but HDT has several projects underway. Contact me for the latest homes.